Here she is Bijou's very own Punky Brewster! 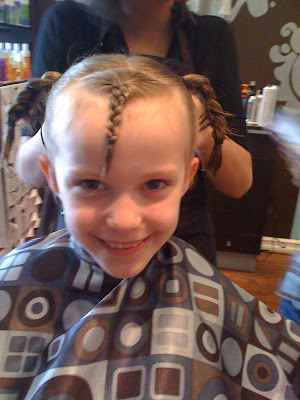 Does anyone remember her hairdo the last time, if not, click here! So this time, she was going for a big change! I don't know if you can see it or not, but Kimberlee is cutting her hair right up to her hair line for a really cute stacked out bob! Now here she is again, all finished and plotting her style! It looks like she is saying a pony here, and then this here! Boy wait till this little one goes to her prom! So the tragedy here is.....NO PICTURE!!! Yeah, we're not perfect! But let me try to tell you how it was....a braid to the left, a braid to the right, zig zag from the top to the bottom and a braid straight down the middle in her bangs! It was pretty cute. Lil Punky is used to being on blogs, her Mama has one too! Maybe she has a picture, since we forgot! See look at that! The magic of internet, her mama read this and then sent me over a picture, now you don't have to use your imagination!